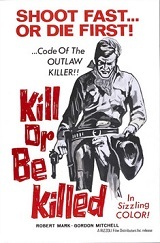 A wandering gunfighter (Robert Mark) gets caught in the middle a feud between two rancher families. One of them forces him into a showdown and he kills his opponent. He must then escape from the angry family and is falsely accused of killing two sheriff's deputies. He is saved by an old man, who helps him to get revenge and to prevent the girl he loves from marrying a murderer. Also stars Elina De Witt and Fabrizio Moroni. Also with Gordon Mitchell.